A modern mid terrace house located within a cul de sac, situated within walking distance of the nearby shops and not too far from Wymondham town centre. 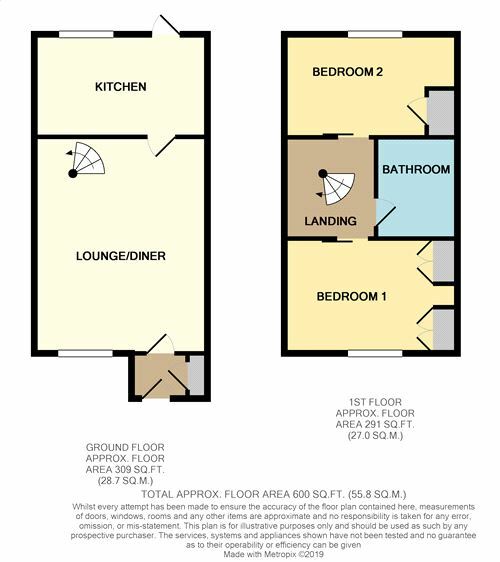 The accommodation provides 2 double first floor bedrooms, on the ground floor is the lounge/diner and fitted kitchen. The property benefits from gas central heating along with double glazed windows and doors. From Attleborough proceed on the A11 north bound taking the 3rd exit for Wymondham, from the exit slip road turn left and proceed to Police HQ roundabout, turn right and proceed to the Waitrose roundabout, continue straight across into Tuttles Lane East, then take the 2nd turning left into Lime Tree Avenue, proceed for approx. one mile, Abbot Close will be found as a turning on the left hand where the property will then be found in front of you as you turn in. Double glazed front entrance door, built-in storage cupboards housing fuse box, door to lounge diner. 15' 9" x 12' 7" (4.80m x 3.84m) Spiral stair case to first floor, radiator. 12' 7" x 7' 5" (3.84m x 2.26m) Fitted in range of matching base units and wall cupboards with fitted work tops comprising sink unit, cooker space with extractor hood above, plumbing and space for automatic washing machine, fridge freezer space, double glazed door to rear garden, tiled flooring, tall cupboard. 12' 7" x 8' 3" (3.84m x 2.51m) radiator, fitted wardrobe cupboards. 12' 7" x 7' 5" (3.84m x 2.26m) Radiator, built-in airing cupboard housing wall mounted gas combination boiler, access to roof space, recess with hanging rail and curtain. Fitted in white suite comprising bath with independent shower over and splash screen, w.c., wash hand basin, chrome towel rad. The front garden is open plan and shingled with a timber wheelie bin storage area and paved pathway to the front door. The rear garden measures approx. 43ft and incorporates a paved patio with a low level dividing fence and gate leading through to a section which is laid to lawn with a timber shed and rear access gate leading out to the car parking area.